Closing up my control panel over the next couple weekends. Haven't really shown many people. Getting antsy to show it off. All the artwork is hand painted by my buddy who works for hire(Will do whatever the hell you want). Let me know what you think. Hi Everyone, I don't know if this has been mentioned here or not. CabVol is software that helps control the wav volume on your pc. Here's how the software developer describes it: ...I threw together a small application which allows you to set a hotkey which, when held down, allows you to control your windows wave output volume using a mouse device (spinner, trackball) and/or keyboard device (joysticks/buttons connected to a keyboard interface such as IPAC or keywiz). Basically you can set it up to control cabinet volume using only arcade controls. It only works on NT/2000/XP/Vista and it requires the .NET 2.0 framework which you can download from microsoft. There are a bunch of apps like this out there, but the ones I've tried are not very cabinet friendly (requires use of the mouse scroll wheel, special 'windows' key, etc). I hope someone gets some use out of it. Links:NT/2000/XP (this build does NOT work with Windows 7 and higher): NT|2000|XP Windows 7 (ONLY works with Vista/Win7/Win8 and higher): Windows Vista + Forum: http://forum.arcadecontrols.com/index.php/topic,69901.0.html Hope someone finds this helpful! It works great on my cab! This is a set of arcade cabinet images intended to be used as banners for arcade platforms or playlists in BigBox. To achieve the look from the example screenshot, I recommend using my corresponding Simple Arcade Clear Logos set along with keltoigael's CityHunter theme. 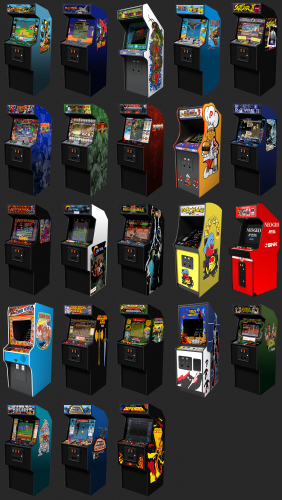 After being inspired by the arcade section of viking's Hardware Platform Set I set out to create some arcade cabinet images with a more retro look, like the dedicated cabinets of the mid to late eighties and early nineties. In most cases I used Williams Electronics' Defender as a template, adding the marquee, side art, bezel, control panel overlay, and gameplay images of a representative game from each developer to create an end look that in many cases is very similar to the original cabinets. In some cases I took more creative license, such as with Cave's DoDonpachi, and in others simply polished and modified existing images of iconic cabinets, including BurgerTime, Centipede, Donkey Kong, Pac-Man, Space Invaders, and the Neo Geo MVS system. Platforms/Games: Arcade Classics: Cabal (TAD) Arcade Shooters: Raiden (Seibu Kaihatsu) Atari: Centipede Capcom (non-CPS): 1943: The Battle of Midway Capcom CPS-1: Street Fighter II: The World Warrior Capcom CPS-2: Marvel vs. Capcom: Clash of Super Heroes Capcom CPS-3: Street Fighter III: 3rd Strike Cave: DoDonpachi Data East: BurgerTime Irem: R-Type II Jaleco: The Astyanax Konami: Contra Midway: Mortal Kombat II Namco: Pac-Man Neo Geo: Multiple Nintendo: Donkey Kong Sega: Golden Axe SNK (non-Neo Geo): Ikari Warriors Taito: Space Invaders Technos: Double Dragon Tecmo: Rygar Toaplan: Twin Cobra Williams: Defender Installation instructions: Unzip archive. In LaunchBox, right-click on desired arcade platform or playlist, then click "Edit." In the "Images" area on the right hand side, click "Add Image" and browse to the desired banner image. Once the banner image has been added, right-click the banner image, select "Image Type," then "Banner." In the "Notes" tab, copy and paste the platform text from "Platform Descriptions.txt" into the editable text field. Click "OK" to confirm changes. Just finished my arcade build. 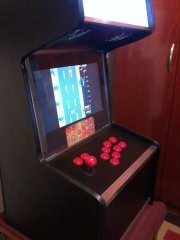 Comes together nicely with Launchbox:) sanwa jlf joysticks, Happ buttons with cherry switches. Uses ipac 2. 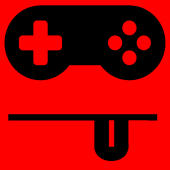 Just ordered pac link to get xinput on the controls so I can set up Steam controls easier. Launchbox setup was super easy thanks to ETA primes videos! I've recently ordered the Ultimate Widescreen bartop cabinet from Haruman Customs and now need to plan out my visual aesthetic for the marquee, side panels, and CPO. What I'm thinking so far, since I love the CityHunter theme and will be using that in the arcade cab as well, is to stick with the 80s/retro/cyberpunk style. If all goes as planned, there should be a consistent look and feel with both the cabinet itself and the software. My working title for the marquee is "ROM Runner." I like this because it is a play on Blade Runner, keeping with the cyberpunk theme, and the system will literally run ROMs as it's a MAME arcade cabinet. My first mockup of the marquee is attached. What do you guys think? Woke up yesterday, decided to teach myself Google Sketchup... never worked with CAD like programs before. Managed to get a very accurately designed cabinet made based on a side view outline I made. Glad I did, was able to avoid a few potential issues that would have been missed if drawn on paper. Still a bit to tweak here and there but, for the most part, I have all the braces in place inside, location of the holes for buttons, even little LED strips for the marquee. Just finishing up the back now. For extra airflow, instead of a door or wooden access panel, I'm using a 16"x20" furnace filter. I'll have a 120mm fan near the top to blow out warm air, but figured with the furnace filter I'd get better air flow and no dust inside. Bought a power bar off Amazon for $17CAD with surge protection and a 12' cord, was cheaper than buying wire and a plug to run to a light switch then to a power-bar anyways. This way I can cut off 10', wire it up to a light switch about 4' up, and have 2' from the switch to the power bar inside. 2 small holes under the monitor are for USB plugs I got off eBay for times I may need a keyboard or controller. The small hole between the speakers, I initially made for the volume knob for the AMP I got (also eBay) though may set the volume and use a button-combo to adjust the volume, and use that hole for a power button for the PC since I have a small one about 1/4" in diameter. Speakers, I have a pair of full range Sony 3.5" speakers I got for $3/pair at a garage sale. Were from a surround setup, but very heavy duty magnets in them. Still waiting for that eBay amp so I can test them out. Will have a joystick, 6-buttons, coin and player button for each (two) player. Plus 4-aux buttons recessed at the front so can't accidentally press them. Using these buttons from Amazon. Idea for this one was to make something a bit shallower and narrower than traditional cabinets. Plus I wanted the marquee to sit back more... I'm 6'3" tall and I don't want to have a marquee right in my face, and because of the angle I'd have to look down at, if it sticks out too far it would block my vision a bit when looking down at the screen. Sides are 3/4" plywood, as is the control panel and monitor panel. The monitor hole will be cut at the front to match the screen size, and at the back I'll route in 1/2" for the dimensions of the monitor's frame, that way the screen will only sit 1/4" away from the front. I may even route the front a bit, use a bit to add a 45' angle cut 1/8" in. The bottom of the cabinet will have doors and shelves for storage. Debated a drawer for a keyboard but, unlikely I'll need it... probably use a Rii when needed. Overall dimensions so far are 6'2" tall, 26" wide and 22" deep. PC specs in my signature. I'll keep this thread updated as I go... just looking for some thoughts/ideas so far. Finally got most things sorted out, decided to go Launchbox over RaspPi, have some computer parts on order and some hardware. Buttons wise, I went for a kit and the seller was nice and threw in an extra coin button. Kit was for 8-buttons per player but only using 6. So, plan is.... each player has the joystick, 6 buttons, a Player 1 or 2 button, and a coin button. I read that it was a good idea to have about 4-buttons for admin stuff, which is what I plan to do with the 4-buttons I have left over in the kit. Questions are 1) What do most people have the 4-buttons assigned to? EXIT I assume would be one of them. 2) Do I need any more buttons? Realized this morning, I totally forgot about a power-on button for the PC. Which is why I decided to post, see what people have setup on theirs, and if I forgot any more buttons. Hi All im in the process of swapping hyperspin for Bigbox on my arcade cabinet. I have a 2 player (7 button) cab with player credit and start buttons for each along with an exit and pause buttons. it all comes down to personal preference, but, I was wondering what Ui shortcuts others have mapped to their control panels and how they layed them out. I've been using a RaspPi for the past half a year with a PS3 controller and RetroPie. I was going to build a game console, like an NES or PSOne etc... and make custom joytsick with arcade buttons etc... got most of the parts, but more I look at builds, the more I want a full size cabinet. And while searching, I came across LaunchBox... which I know, uses a regular motherboard, not a Pi. At that point now where I'm debating which way to go really, and had a few basic questions since I'm still researching a Windows based system vs RetroPie. I saw Launchbox on a YouTube video, and looked great, but also see stuff mentioned about bigbox, hyperspin, retroarch, attract mode... are those plugins? skins? different versions of a similar app? is ther a decent Wiki or something that lists all that stuff and what it's for? Does Launchbox come with all (or most) emulators already installed, similar to Retropie? If I wanted to play games from PS2, like God of War... what type of system specs would I be looking at? RaspPi was pretty good with most stuff but it only went so far... no PS2 games, and arcade games older than the early '90s. I'm not a gamer so, I'm not sure all what I'll be playing, but I know a few more modern titles for sure. Plus of course, all the '80s arcade games, NES/SNES/N64, Sega Systems, TurboGrafix16, etc... which I assume will probably play fine on a quadcore 4GB system with a decent GPU. I have a spare GT650Ti videocard I plan on using... nothing great but, I don't have the budget to build something like an i7, 16GB ram and a GTX1070 or something either. For a cabinet build, looking at something around 24" 16:9... would a TV or PC screen be better? 720p/1080p? Seeing that a lot of the under 29" TV's now are 720p... at 24" the 720p is probably good enough? Other concern is the response rate. For my PC, I made sure to grab something faster than 5ms, a lot of TV's I'm looking at seem to be around 15ms. I see a lot of builds with 32" TVs... any issues with stuff like ghosting? Main reason I'm asking is if not really enough of a difference to notice, I'll go for a TV simply because new or used, they seem to be cheaper than PC monitors once you hit 24" or higher. Will the Zero Delay USB boards work for the arcade buttons? I already bought the kit, for weeks I was planning the console RaspPi build... then of course, after I pull the trigger and buy stuff THEN I see this app and start rethinking it all again. Sorry for the noob questions, just looking for a bit of feedback to see which way I should go... once I start building, I don't want to re-rethink the idea again. Hello guys, As everybody here, I love using my BigBox, and have participated on the last two surveys that was sent out.. I love to see it improving over time. I have one suggestion though, that hasn't being brought up. 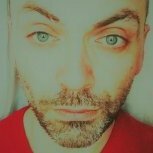 I love to play arcade games with the banners/filters that has the cabinet images on the sides, but that's too hard to configure, and specially to keep consistent, because LaunchBox is a frontend, maybe we could automate that somehow on LaunchBox/BigBox, and have the cool download functionality as we have with the other assets/media. That would be awesome wouldn't it? What you guys think? Maybe add this to the next poll? Thanks guys! and keep up the great work! My first cabinet made of an old dressing Cabinet and a old computer!